I got stopped writing through the alphabet because I knew what “J” was supposed to be, and I didn’t want to face it. I’ve started and stopped this post several times over the past few months. But finally, here I go. My dear, dear friend and former neighbor, Julie MacPhee, died last summer, on July 8, 2018. She didn’t show up to join her mom for church on Sunday, and when her brother went to her house to check on her, he found her—already gone. I got the news through a series of texts and refused to believe it at first—until her sister called me directly to tell me what had happened. Not that anyone knew what she died of. A heart event perhaps? Then I was stunned and beyond sad. A gaping hole in my life opened up. And it’ll never be filled. Everyone dies. We all know this and yet here in the West many of us do a pretty good job of ignoring the inevitability of death. I usually do. Maybe this is even healthy because, honestly, how could you carry on with your daily tasks if you had to live with your own death and the death of everyone you love weighing on your consciousness? But then when a loved one goes—without warning—the truth of life’s outcome is in front of your face. And all you can do is eulogize. Allow me to eulogize. I need to. Julie was an unexpected gift to me. I moved into her neighborhood and we must have passed each other on the sidewalk for a year with friendly hellos before we finally got into a proper conversation. Julie was training for a marathon, she told me, so we instantly realized we had something in common. For me, the marathon life was a great adventure, a life-style I was embracing and growing into at the time. For Julie, the marathon held a very special meaning quite different. Julie had been heavy for most of her life and, when we first became friends, she had recently had weight loss surgery—something she’d wanted to do for a long time. She was almost to her goal weight and was getting ready for the Bellingham Bay Marathon as she embraced a new life full of exercise and eating healthily. I asked her her pace and it seemed like we might be compatible running partners, so we gave it a try. We were. This is how Julie became my most regular, consistent running companion for several years. We spent so many hours together on the road and trails over the next years that we developed a sister-like relationship, including annoyances and private jokes. Julie fell a lot, for example. Once, when we traveled to Disneyland to run the Tinkerbell Half Marathon with two of our other neighbors and two of my pals from Seattle, Julie did a face plant on the street the day before the race. We were on a slow run through a neighborhood there in Anaheim, and she just inexplicably tripped… and went down. She hit her cheek on the cement but bounced back up onto her feet so quickly that I wondered if I’d imagined the fall. We joked often about how much that fall had traumatized me and how for her it was no big deal—just one of many tumbles Julie took for no apparent reason. 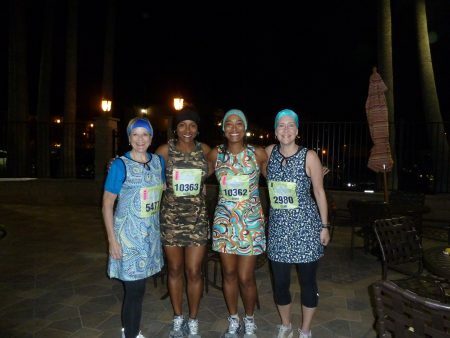 Getting ready for the Tinker Bell half marathon with Julie, Alisa, and Sonia. Over the years, we ran in the pouring rain, in the snow, in the sunshine. We ran when we had colds and when we were mad at someone in our lives. We ran after she pulled 12-hour shifts as a night-time labor and delivery nurse at the hospital. We ran while I was writing Second Wind. I ran the last eleven miles of her first marathon with her. She ran the last two, terrible miles of my hardest race–a 50K–with me. We traveled together and ran in at least three different U.S. States besides Washington. We ran until Julie had a health event and ended up having another surgery, and then we walked. 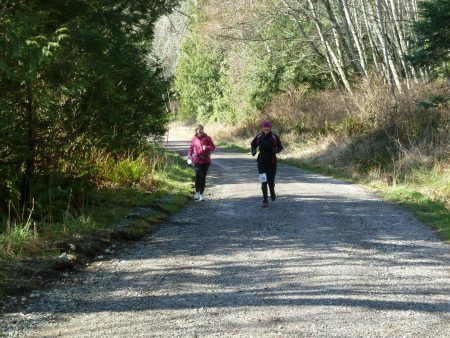 Julie helping me finish the Chuckanut 50K. She’s laughing at my pain. 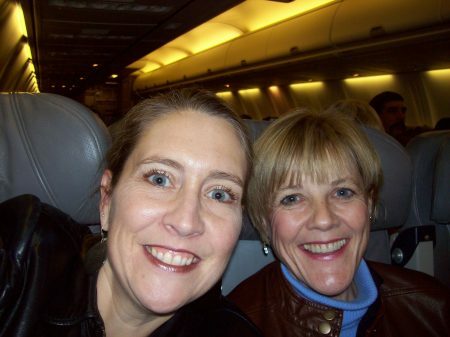 Julie was not the kind of friend who helped me psychoanalyze myself. Instead she had a practical way of being present for me. She shopped with me. She babysat my dogs. She gave me rides to places I needed to go. She treated me to coffees. PRESENCE is what Julie did best. She showed up. For years, she just showed up in my front yard and waited for me to come out of my door so we could hit the trail behind our neighborhood. Daily. I mean it. Every. Single. Day. Until I moved away. I know Julie was beloved by hundreds of people. She had a big family. And she’d served as a nurse for many years. Her friendships were the life-long kind of friendships. So I know her absence on this planet is felt acutely. For me, as I said, a big hole opened up in my life, and I’ll have to get used to it. I keep scrolling my phone, even now, waiting for a text from her to come in. She’d never go this long without texting me. I’ve tried to send her a note. But her phone number belongs to someone else now. I miss you. Where do I send that message? I hope she knows. I know, Sonia. So hard. Thanks for your “J” for Julie. It was very apt. We loved her dearly and miss her greatly. She was truly a very special niece to me. We grieve with you and hold fast to the belief that we will see her again. So much love and light to all of you, Katy. She talked to me about you often–with love and appreciation. I is for I Did It!